Our daughter Daisy is in Year One. Just wanted to say how absolutely encouraged we are by the start of her new year at Elham School. Daisy was very happy in year R but struggled a little academically. I have observed already this year that Daisy seems to be learning much faster and is more keen to learn. Miss Shepherd did an excellent introduction to her class and how things would work at the school drop in. It was informative, comprehensive and she was very approachable. The classroom was organised and she had already provided feedback in the reading trackers and put photos on the website. She encouraged me to keep in touch regarding Daisy's progress and I am so heartened by this. She also gave me some ideas of how to help at home. Very pleased with an organised and communicative start to the year. Daisy is very happy in her new class. I just want to say what a wonderful experience the church service and nativity play was in St Mary’s Elham today. A bit sad as it will be our last, but I was very proud of the school, both children and staff. With our daughter in her last year there now, it is a bit of a time of reflection, and I am positive she has benefitted enormously from being at Elham school for her junior education; for it is demonstrably a great school! 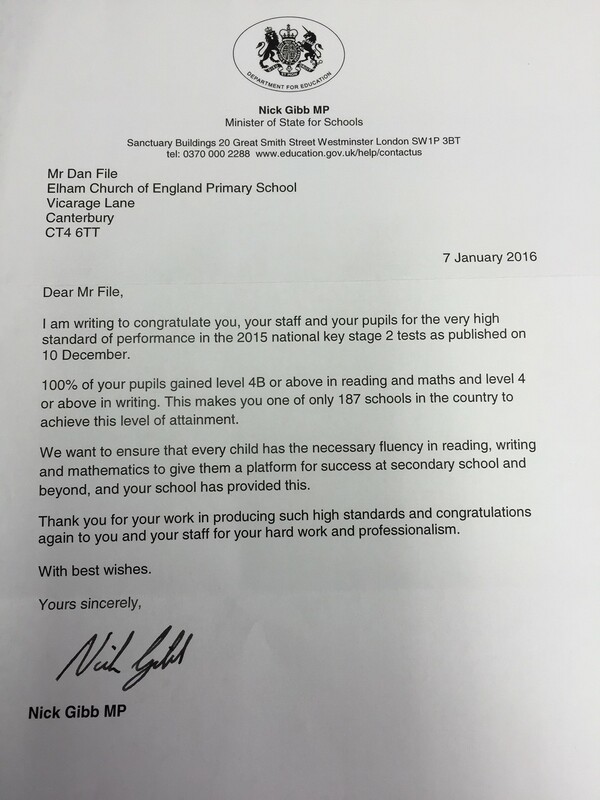 This shows not only in OFSTED results and league tables (I suppose they are important) but it also shows in the enthusiasm, politeness and levels of displayed knowledge from the children; Elham is a church school and it shows! Thank you Head-teacher(s) and all your staff! You should be rightly proud of your efforts. The Nativity Service provides an opportunity for us all to come together as a community and to celebrate the children's learning and contribution. Little things make a big difference, using the microphone for the readers, having the carols projected on the screen for all to see and the order of service complete with a photograph really made it feel to me, as a parent, that this was important to the school and not just another thing to get through before the end of term. Having Kate McNeice as part of our service also made a positive difference, though I did wonder with two "larger than life characters" where it might end! Fortunately and correctly, the children and their efforts were always center stage. In a Church School Christmas really should be important as a time for celebration and reflection I felt that this year it really was. I would like to thank you for all your hard work to achieve this. Good academic results are important to some people, but having them does not make our children better people. Nor do they make lasting memories to be treasured. For pupils, school should be the whole package; about belonging, feeling valued, feeling safe, feeling happy and willing to learn and feeling that they matter and can contribute. I appreciate it is not an easy job but I hope that Elham has now found its way.